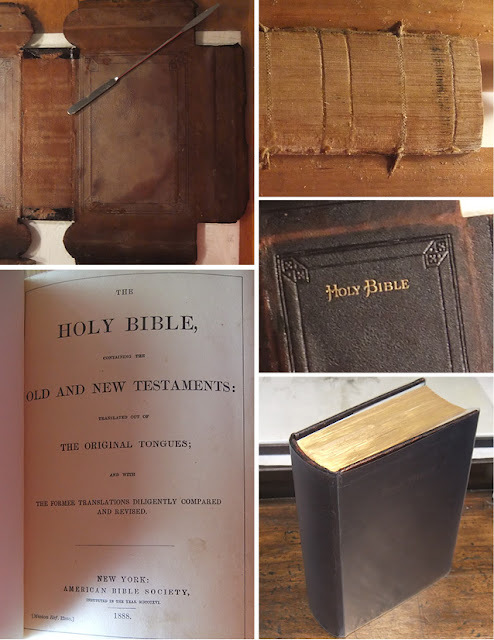 The owner of this fragile 1888 Bible asked me to rebind it while preserving the original leather cover. The leather cover and spine linings were carefully soaked and scraped to remove the old cover materials and glue. New boards and endsheets were attached, and the binding was heavily reinforced with cloth and paper. Finally, everything was put back together and the cover fitted with a protective clear plastic dust jacket. The book still retains it’s original well worn look, but is now structurally functional for everyday use! If you have a book that needs repair, let me know.